Q. How do I confirm that my students completed the Spark Tutorials? In the left sidebar, click Participants. Click on a student's name to view their profile. Under the Course Details section, click on Pollak Library Spark Tutorials. (Note: You must also “enroll” in the Spark Tutorials to view badges.) If this course is not listed under a student's profile, the student has not completed any tutorials. Look for the badges section (see example). If there is no badges section, then the participant has not earned any badges. If they haven't earned any badges, they haven't completed any tutorials with 100% on the final quiz. For each tutorial completed with a 100% score on the final quiz, participants will earn a digital badge. They look similar to the badges depicted in the example provided above. Each badge has the name of the tutorial for which it was issued and is linked to metadata about the tutorial. If the tutorial was not completed with a 100% score on the quiz, the participant did not earn a badge. 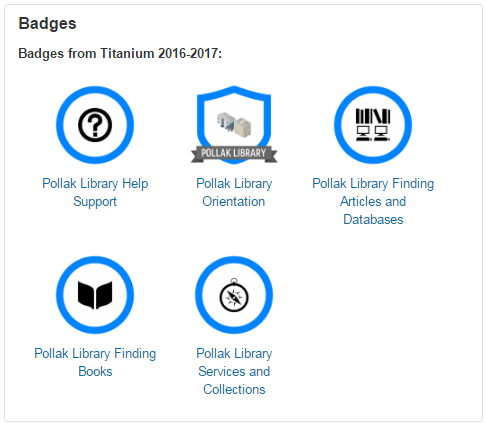 If the participant earned the "Pollak Library Orientation" badge, then they completed all four Pollak Library Orientation tutorials. This badge is only issued after students complete all four tutorials to signify their achievement. Or, your students can take a picture of the badges they've earned and send it to you.